Great battery delivered as promised in decent packaging so well protected. 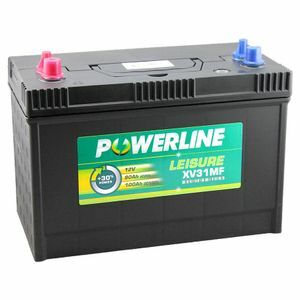 The XV31MF battery was really good value for money, and has performed well for three years so far. The service from the sellers, Tanya batteries, is at least 6 star !! Would not hesitate to buy any future batteries from them, highly recommended. Great value leisure battery--bought to run the local Rotary "Santa sleigh", plenty of capacity to last all evening with lights staying bright and music staying loud. We had to change the previous battery half way through the evening, so a great improvement. Great price good product and good fast delivery ??? Second battery I've bought from Tayna. First rate delivery, very well packaged and the product works very well. Competitively priced too. Great - bought 2 for my 24v lorry - thumbs up - delivery next day was great too ? Good quality, reliable heavy duty power source. A weighty but compact design. Worth every penny. This is the third one of this type I have had.The first one lasted 4 years,the second one is 4 years old I think but still in use. just the bty I have been looking for will use again but hopfuly not too soon thanks for quick delivery. The service was very quick, at first I thought I had ordered the wrong battery for my caravan and called the company to see if I could return it. The gentleman I spoke to was so polite and helpful and gave me advice, as it turned out his advice was right and the battery was the correct one for my caravan. I was very impressed with the quick and very helpful service. Its been used as for motorhome, not been fitted long enough to evaluate yet,but time will tell. Had it delivered to Spain, great service and found the website very user friendly.Only ws that the wing nuts supplied were wrong, but no problem as some more are in the post. Excellent service and delivery. Battery in operation with a clay pigeon electric trap. Working well. (One minor point, supplied with one large and one small wing nut. This battery uses two smaller ones).